Are You in Full Control? Over the last few decades, every operational requirement in pipeline management was solved with yet another isolated information system, such as pipeline integrity management systems (PIMS), management information systems (MIS), enterprise resource planning (ERP), etc. The introduction of more smart devices, where 200 parameters per device are the norm rather than special, and the current trend of consolidating operations across dispersed assets over larger geographical areas, has resulted in mind boggling quantities of data. Some striking numbers emerge: only 5% of this data is transferred into meaningful information, only 10% is relational structured and more than 50% of the data has poor data quality. Pipeline management and SCADA systems are a big step forward in the industry, but connecting a number of databases up does not automatically turn the data into valuable knowledge. To really capitalise on the extensive data gathered, pipeline companies need to think about their information strategy. The requirements for an enterprise-wide pipeline management solution are driving the need for collaboration and information sharing across different platforms, systems, geographies and corporate networks. This aims to provide the opportunity, with the underlying technology and network, to allow any device or application to connect to others seamlessly, while managed as a single system from an operations, engineering and maintenance point of view. An integrated approach for applications and connected platforms results in better analysis and performance of a pipeline business, while reducing engineering, maintenance and training costs considerably. This will assure far greater adoption and impact, since in the end it is about the enterprise working more effectively and achieving better results, in compliance with, for instance, PHMSA safety standards and regulations. Having said that, it is not an easy task converting incoming data into valuable and usable knowledge due to present standards, and existing tools that companies are hesitant to replace. This requires change management with a focus on information instead of technology. Nowadays, process automation within a company is scattered across a lot of autonomous systems. For large-scale geographically dispersed pipeline projects, there may be a hierarchy of individual process automation systems, which in turn are each responsible for a specific region or pipeline section and are managed by a higher level system. Engineering of systems on this scale is a huge challenge, aside from deploying an information strategy on this, because each individual system has its own databases, formats and its own configuration. In addition, the information obtained through a local automation system often has to be integrated into an enterprise information system, which is composed of many other sub-systems. Engineering and maintenance of these systems is a complex and labour-intensive task, because although the systems are interrelated, each has its own method of configuration based on different user interfaces and engineering principles. In practice, things must be duplicated and configured multiple times. Figure 2. 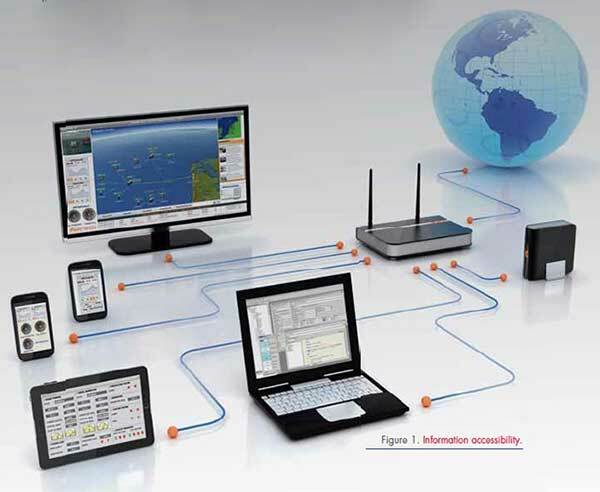 Yokogawa collaboration – decision support centres. This requires a flexible, scalable architecture for enterprise automation solutions, by supporting a high number of multi-level/multi-node configurations and a consistent system-wide information relationship model that acts as a configurable adapter to connect to various information sources and services. Such features lend well to large scale infrastructure projects such as pipeline grids and inventory management environments. Engineering is performed in a single environment from which the application objects and database can be deployed to the appropriate server levels. The reality of today's pipeline operation is often quite different, but emerging standardisation and new IT technologies enabled Yokogawa to innovate its solutions in this direction. These enable deployment of enterprise automation systems that maximise the entire pipeline management processes, reduces losses and that are complemented by strong energy management. The systems improve the bottom line of pipeline operations through continuous monitoring, simulation, and optimisation of the pipeline infrastructure. With the enormous increase in available data and great efforts made to turn it into meaningful information, the best way of representing this to users also needs to change: by displaying information instead of data. This means, for instance, changing from PID loop-control management to output and safety control of an entire pipeline, where measures are taken based on, for example, energy usage and reduction, or on capacity and throughput. Every process phase has other sets of priorities of what is important and how to represent that information by trends, reports, process displays or dashboard type KPIs. Yokogawa's initiative on this topic is called the 'advanced decisions support' approach, which is basically about the needs of next generation industrial automation. ADS is aimed at improving the effectiveness of operator decisions to support, rather than replace, operator judgment. ADS integrates existing, but separate, industry standards into a cohesive solution. ADS is based upon research into human-automated path planning and decision support. ADS is derived from Yokogawa's active participation and membership of The Center for Operator Performance, which was established in 2007 as an alliance of industry, vendor and academia representatives to research issues facing the oil, gas and petrochemical industries in the areas of human factors and operator performance. The mission is to raise the performance level of pipeline operators and improve health, safety and environmental effectiveness. Technology is an essential part of this and organisations are seeking a new level of decision support to balance their day-to-day pipeline operations versus OpEx costs. Collaborative work environments will provide, among other things, a holistic view of pipeline asset efficiency and performance that spans across business, maintenance, safety and operations management. Collaboration improves the situational awareness on a larger scale, and results in more efficient and thorough decision making by looking at pipeline assets in terms of their criticality and contribution to bottom line results. This starts at the devices level and moves up through the automation layers, consolidating information from multiple sources (including KPIs, manual inputs, workflows and observations), looking at profitability and reliability of the assets, and therewith achieving advanced decision support. While the pipeline operator is directly monitoring and interacting with the process, stakeholders will also be interested and involved in specific decisions. Each will have their own objectives, preferences and goals, informing their opinion of the status of the process. An example of how collaboration improvements can be achieved is by considering the individual needs and providing the information through separate levels and multiple display layers. Where Level 1 is the boardroom level ('how much money is the company making? '), Level 2 is more a methodology on which graphics are used to 'steer' (manage and operate) the pipeline. On Level 3 (graphics), problems are solved on the basis of PIDs translated to graphics (control and diagnose). Dividing HMI graphics into levels and layers is one thing; but behind the scenes auto-loop tuning would be a recommendation rather than manual steering. The tendency is that operators think that they can do a better job in optimising, rather than automatic process control software where loops are automated as part of the project. These can perhaps be tuned during the system's lifecycle by a specialist team in close co-operation with operators. For pipeline operators, mobility is added to the equation. Wireless is the next step towards the deployment of standard IT solutions in the world of pipeline management and process control. In bringing down the walls of traditional ways of information gathering and delivery, this mobility is game changing. With the adoption of wireless communication, which is supported by industry standards such as ISA100 and ISA99, the use of mobile devices including tablets and smartphones come into play and will be an increasingly integral part of information technology infrastructure. Wireless enables organisations to measure and share context based information anytime, anywhere, like providing real-time insight to timely localise incidents and make faster and better informed decisions. However, today's security-conscious climate demands that the modern systems be able to prevent system compromises in order to provide safe and reliable services to its stakeholders. Mobility has a big impact in virtually every aspect of today's work/life environment. It allows companies to enter a new era of possibilities to bring agility, speed and efficiency to the next level and guide a collaborative network of mobile operations personnel. With the explosive use of popular websites such as YouTube™, the embedded advertising and video environments have spurred technologies in the direction of HTML5. 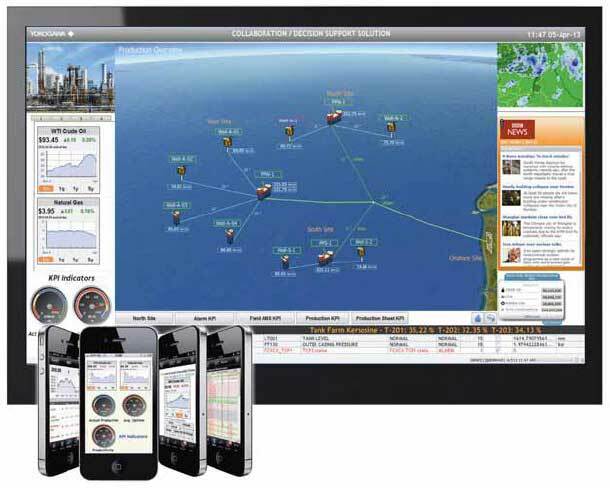 Solutions based on HTML5 technology in the oil and gas industry can show dynamic graphics, animations and multi-media content on any smart mobile device with a modern web browser. But there is more application-specific value that can be delivered through mobile technologies. Since most smart devices have a GPS receiver as well as a gyroscope, this allows new powerful mobility applications to facilitate operational performance and efficiency improvements, such as GPS-based localisation (geo-tagging), augmented information and mobile-centric mimics. Take for instance the recent pipeline upturn in North America. Until recently, North America was considered a mature pipeline market with few new pipelines being built. The shale boom, however, has led to a dramatic upsurge in construction of new pipelines to move these new sources of natural gas, crude oil and NGLs to market. It might seem that new pipelines would need new pipeline management systems, but this is not necessarily so. The vast majority of the new lines in North America are being built by pipeline companies who will be operating them from their current control rooms using their existing SCADA systems. However, as described in this article, the increase in data and the need to keep overview and develop insight might lead to new information strategies. This is besides the regular and ongoing process of upgrading and replacing SCADA systems in general. Pipeline companies can update their SCADA software to a point but there comes a time when the system must be replaced with a completely new technology. Yokogawa, with its FAST/TOOLS platform, is well positioned for the pipeline management and SCADA replacement market. The company has developed tools to convert databases from legacy systems into new and more modern formats. New graphic displays based on the human-centric approach can be generated by the customer or by Yokogawa's teams, aided, if need be, by the company's corporate engineering centres. D square N.V., an R&D company (spin-off from the University of Leuven, Belgium) with the focus on data mining for the process industry.